Implants require careful precision when lining up the X, Y, and Z axes. Simply being a few degrees off on one of the axes can result in undesirable outcome. With so much pressure, many dentists leave implant placement to the specialists. However, with a CBCT machine, they could easily do implants in house and increase their wheelhouse of services. CBCT machines aid implant placement by giving dentists the ability to see everything in every direction. Dr. John Flucke, a private practice owner in Lee’s Summit, MO describes CBCT machines to his patients by stating, “It allows me to basically hold your head in the palm of my hand and look at you from any angle possible.” Dr. Flucke has a CBCT machine in his practice, and uses it for guided implants. Thanks to CBCT machine technology, dentists like Dr. Flucke can create a 3D rendering of an implant before they place it. This rendering is customized based on specifications entered about the implant. After the implant is rendered on their dental display, dentists are able to fine tune the placement and angulation of the implant before entering a patient’s mouth. This simplification of a process which was once left to experts, has led to an increase of practices performing their own implant procedures. By keeping implant placement in house, those practices are able to build stronger relationships with their patients, receive referral recommendations from practices who don’t do implants, and increase their practice’s revenue. One of the main causes of low treatment plan acceptance rates is due to a lack of clear communication between dentists and patients. Patients often feel they do not understand their dentist’s diagnosis or suggested treatment plan, and dentists often do not do provide a comprehensive explanation of either. If a patient does not feel confident in their dentist, they may avoid scheduling another appointment, or decide to switch to a different practice. CBCT machines can help build your patient’s understanding of their treatment plans by providing you with a detailed and complete set of visuals to show them. In an article by Chicago dentist, Dr. Louis Kaufman, Dr. Kaufman describes the night-and-day difference after showing his patients their CBCT images. Once a patient sees a 3D image of their jaw for example, they can visualize and better comprehend what their procedure will include. After the patient feels like they have a clear understanding, they go home and are able to describe their diagnosis to their significant other. This ability to share their dental results with someone they trust gives them added confidence when taking the next step and accepting their treatment plan. CBCT machines have been revolutionary for the dental industry, and have helped many dental practices expand their capabilities. However, even the best CBCT machine cannot live up to its full potential without a quality dental display. Both of the positive impacts of CBCT machines mentioned in this article rely on one thing – clear images. Some dentists who invest in a CBCT machine for their practice are disappointed in the images their machines display. This isn’t the fault of the machine though, it’s their dental monitor! A regular consumer monitor or even a low grade dental monitor is not equipped to show high quality X-rays or 3D images. What they need is a dental display like DENclarity. 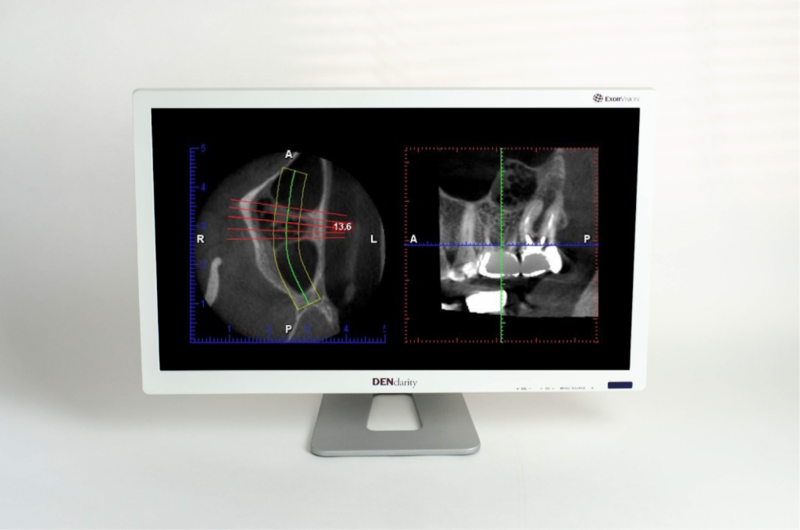 The DENclarity dental display, like CBCT machines, is ahead of its time technology wise. With 440 cd/m2 of lumen, DENclarity has almost 50% higher brightness than most consumer monitors. It also has finely-calibrated grayscale levels so both you and your patients can pick out the fine subtleties of X-rays. Want to learn more about DENclarity? Check out 5 Essential DENclarity Dental Monitor Benefits.